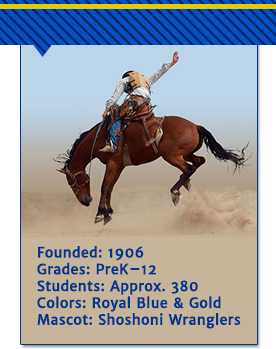 Welcome to the Shoshoni Wrangler website. Learning and fun go hand in hand in our pre-K through 12th grade classrooms. We are a tight-knit community of hard working, hard playing, success-oriented individuals who work together to bring about the academic and personal success of every student in our care. Please visit the pages on this website to learn more about us. Our preschool open house and kindergarten round up are on Thursday, April 25 at Shoshoni Elementary. Please take a moment to complete this survey. We appreciate your feedback! Thank you!